A message of respect and admiration from one captain to the another. 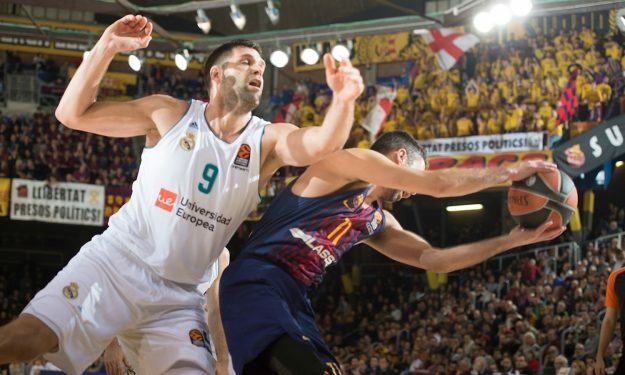 Real Madrid captain Felipe Reyes paid tribute to former Barcelona captain Juan Carlos Navarro during the latter’s jersey retirement ceremony prior to the recent EuroLeague Clasico between the two teams. Reyes has faced Navarro multiple times in the many clashes of the two archrival clubs but he was also a longtime teammate on the Spanish national team. Thus the Spanish center wrote a praising message for Navarro on social media. “Legend, teammate, opponent and most importantly: big friend. What else can be said about Juanki? A jersey for eternity,” Reyes posted n Instagram with a picture of Navarro from Friday’s (2/3) ceremony.